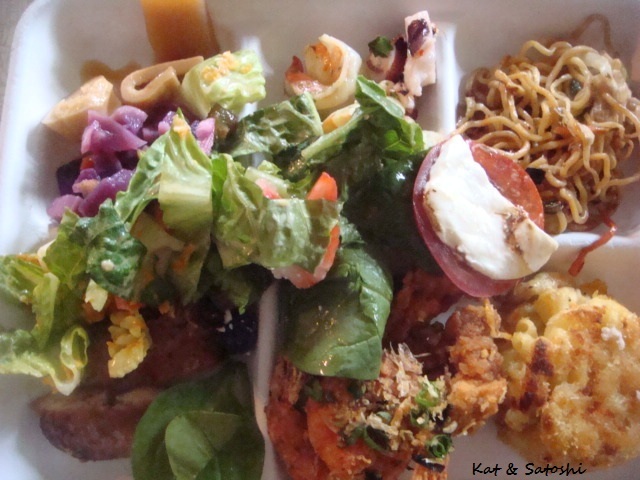 In Hawaii, potluck parties are big. Most times the host/hostess of the party asks the people coming to the party to bring a certain type of dish (like a protein or a salad). And "Hawaii style" means you usually bring more than one dish and usually more food than the amount of people attending. Another thing are the conversations...in Hawaii, most people mingle, walk around with their drinks and/or plates of food in their hands, chatting with the other guests. Kids usually do not bother their parents instead finding somewhere to play. In Japan, from what I've experienced, everyone gathers around a table, and there are many conversations all at once, competing with each other making their voices louder and louder. Add to that, kids interrupting their parents conversations, all in all, it makes for one very noisy affair. 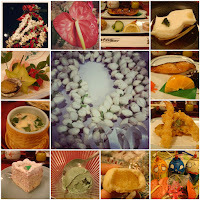 As a guest & hostess I've often felt worn out after attending & having these types of parties in Japan. 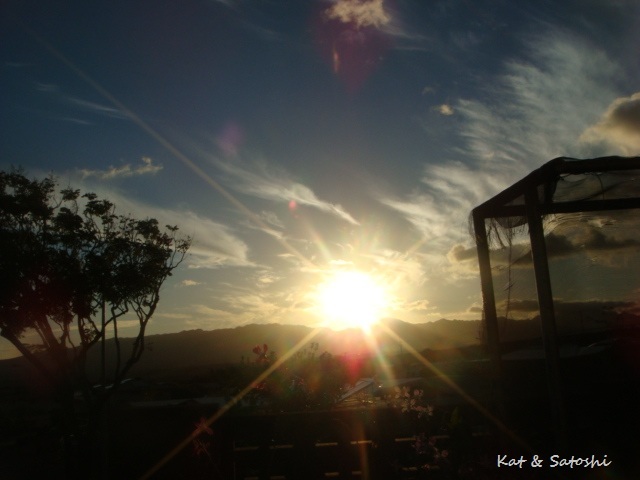 We just had one of these parties over the weekend and, maybe I'm biased, but I enjoyed the "laid back" feel of our potlucks in the Islands, especially with an awesome sunset like this one. Do you have potluck parties where you live? How are they "run"? 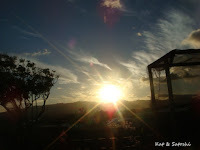 Be sure to check out a sunset while in Hawaii. Most times it'll be bright orange, or fiery red. Over the weekend we helped celebrate my cousin's marriage. It was a small affair. 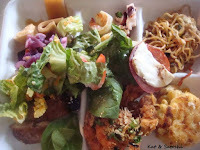 To check out what we had for lunch, click on the photos. Dessert was an assortment of things. And their favors were lemon (white) & chocolate (pink) cake pops. It was great seeing my relatives and all the best to the newlyweds! Always smile when I see these greetings over the entrances to our McD's in Hawaii..."I'm lovin' it!" You now need to show "legal presence". This means you have to show that you belong in the U.S., belong in Hawaii in order to get a license to drive. What a P.I.T.A. I mean, I've been driving since I was 15...15! and now I need to show legal presence...WT?! Many women have stood in line (for many hours) to renew only to be turned away. Reason? they got married, changed their name and needed to show proof of that change...a.k.a. marriage certificate. My parents and I went to the Satellite City Hall in Pearlridge the other day to renew, from filling out the application to standing in line, it took us about 30 minutes total. The types of I.D. we showed were our Social Security card & a valid passport. I was shocked that the new fee is US$40 for an 8 year license (25-71 years of age). I think previously it was US$20 for 6 years?! Satoshi was bummed because he has had a Social Security card and Hawaii drivers license (from the years he worked in Hawaii), but no other valid paperwork for his "legal presence"...boo! At least I passed without a restriction (no need to have glasses on while driving) and I won't have to renew for another 8 years...whoo! 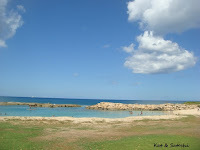 If you'd like more info, check out this link: http://www1.honolulu.gov/csd/vehicle/dlicense.htm". 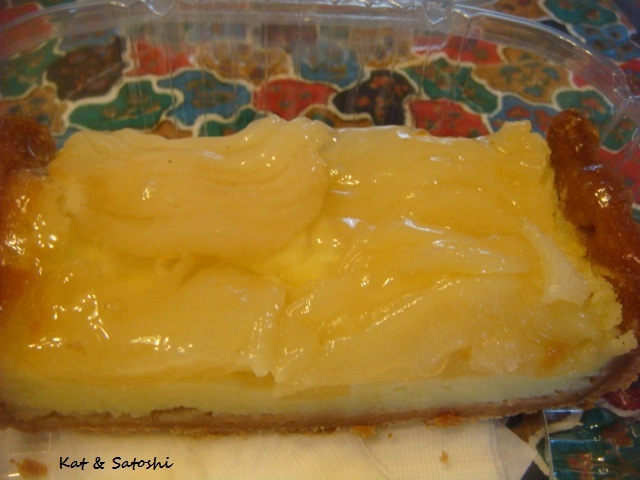 Yesterday, my cousin P and her family, brought over this custard pie along with lunch from Tanioka's. Anyway, the pie was eggy and rich, like custard pies should be. Plus, it was still warm, I think it had just come out of the oven...mmm! 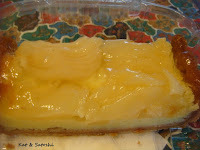 The crust was flaky but not "the best", the filling on the other hand was delish! Tagged along with my cousin, P, who is visiting with her family. We had a picnic at Ko'olina Lagoons, we also brought grandma along. P made some fried ahi (yellow fin tuna) belly, green beans, kabocha (pumpkin), tamagoyaki (egg roll) and musubi (rice balls). The sun was blazing, but it was nice to get out and about. One of my Dad's sisters turned 90 the other day. We got together with her family to help her celebrate at Yoshitsune Restaurant in the Park Shore Hotel, which is at the end of Waikiki. I'd never been to this restaurant nor this hotel before and was pleasantly surprised. If you look at Yelp, you'll see that many were disappointed in the sushi selection. Well, if you go looking for sushi that you can find in the US, like California roll or Rainbow roll, then of course, you'll be disappointed. What is served at Yoshitsune is pretty close to what you'll find in Japan. And if you can speak some Japanese (like me) the waitresses will give you a little better service. 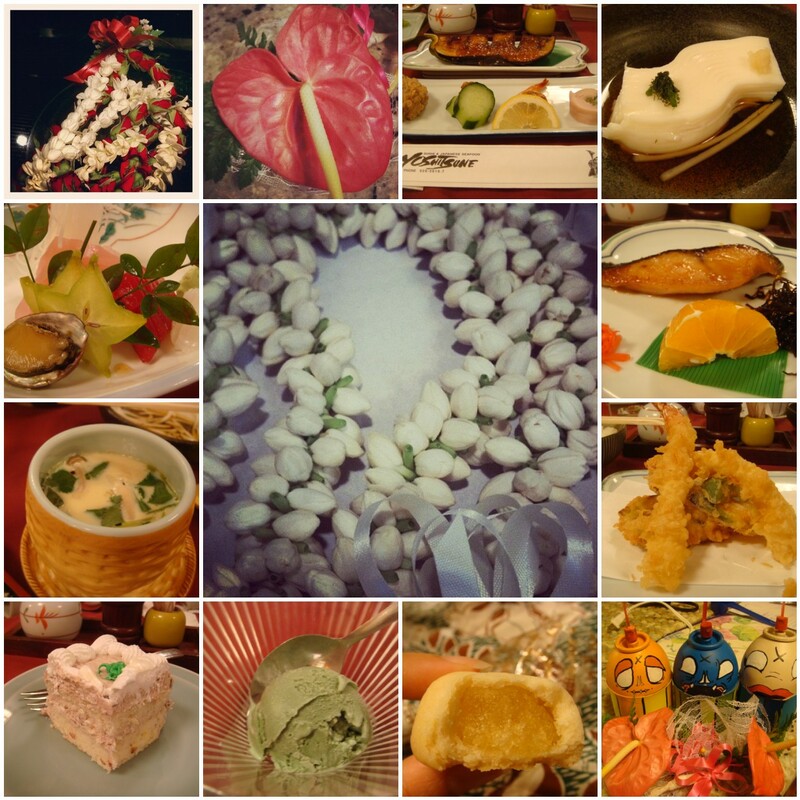 If you click on the photo, you can read up on what we ate. The green tea ice cream definitely had no green tea taste, but the butterfish was perfectly cooked. Oh, and in our sashimi course there was a tiny abalone! Since most times, we get together with my Mom's side of the family, it was great seeing some of my relatives on my Dad's side for a change. Pass these rainbow shower trees almost every day (sometimes more than twice in a day). They have been in full bloom for awhile now...kinda reminds me of sakura (cherry blossom). Sorry the video is kinda shaky. 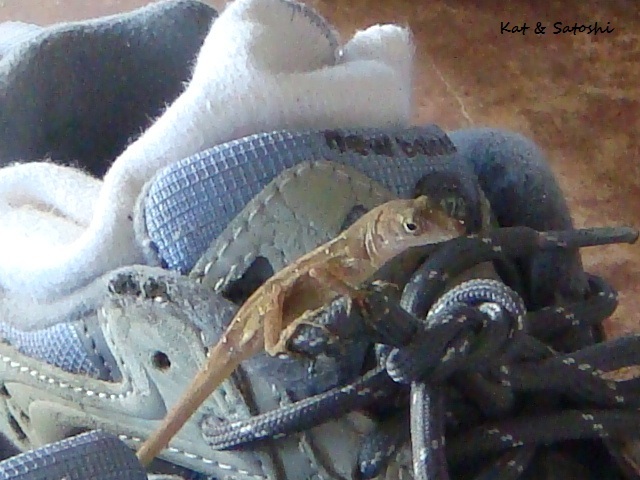 Well, it found a new place to hangout...my walking shoes. My mom says it must like the smell of my feet...ew! 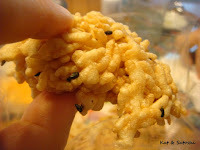 These have probably been around for awhile, but we just noticed them at our local Ba-Le...puffed mochi rice. 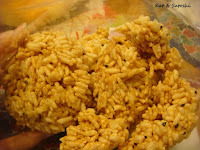 The lady that owns the shop says that a Thai grandma makes them for her. You know anything made by someone's grandma has to be good. I found this recipe online and think this is how it is made. They aren't too sweet and really addicting. I went back to Kamehameha Bakery to check out some of their other items. 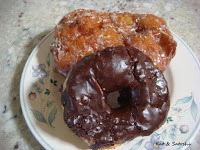 A couple chocolate glazed, an apple fritter & two small ensemadas...everything totalled under $5 (with tax)! The apple fritter could use a touch more apple, but, it reminded me of an apple-cinnamon bread that was deep fried then glazed with sugar...yum! 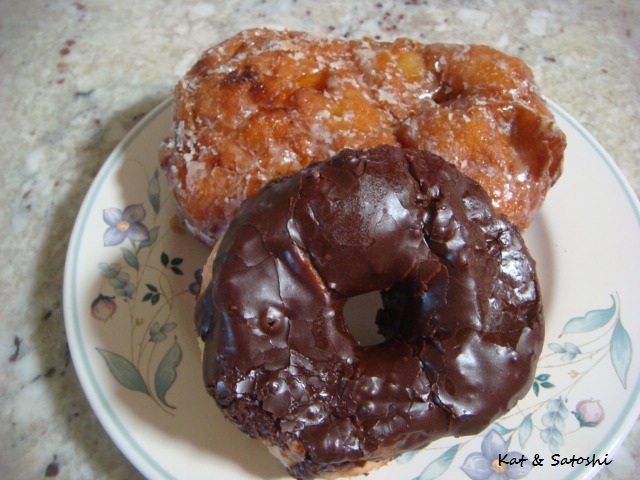 The chocolate glazed are their glazed doughnuts topped with a sweet chocolate. 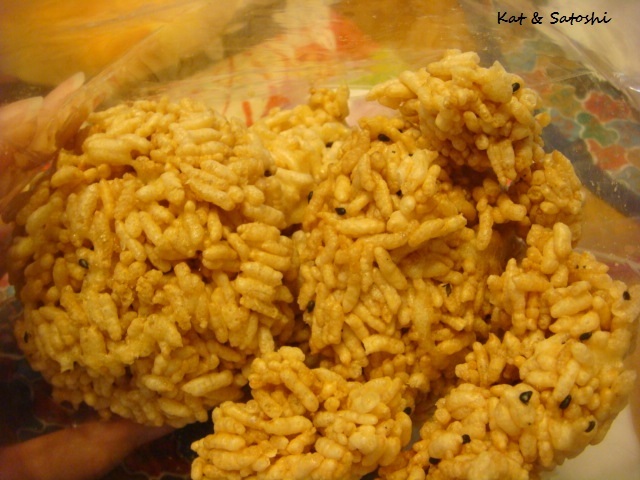 Really melt in your mouth soft and delicious. My mom enjoyed her ensemada and froze the other one for another day. Definitely a great place and relatively reasonably priced. I met up with Val and Greg the other day for lunch and it was nice to catch up with them. My lunch started out with their garden salad. 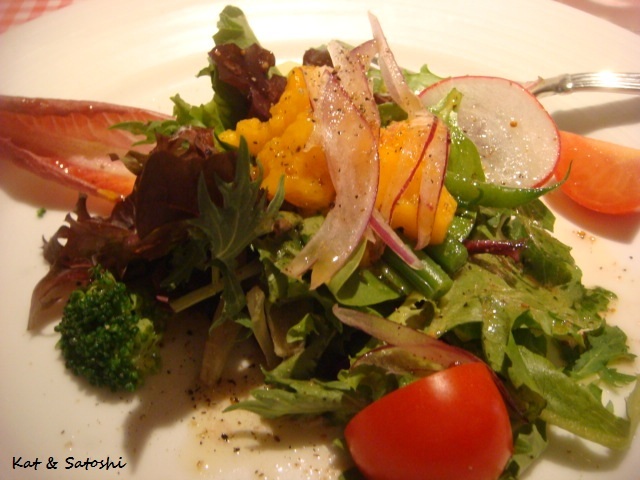 Loved the fresh papaya and tangy vinaigrette. 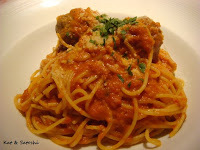 Their spaghetti con polpette (spaghetti & meatballs) was kinda disappointing though. The meatballs were...hard! I would have thought they would be more moist because the menu said they are made with a mixture of pork and beef. And the noodles were kinda mushy. Still, I'm glad they are still in business and it was great to visit with some old friends. I'd definitely go back to try other things on their menu. 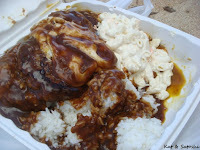 Running late after an errand, we popped into Moanalua 99 to check out what things they had for lunch. I was pleasantly surprised to see the place busy, see, the last time I had been to the area was in 2006 and it was dark, a lot of places weren't operating, quite scary, in fact. After checking out most of the vendors, we chose Mini Garden Express' crispy gau gee noodle...$7.50 + tax. 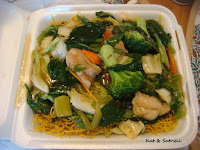 I think this type of noodle is what they call "Hong Kong" style, it is on the thin side. I like it and the fact that they fry it up crisp for this dish too! Another plus is that they pack the gau gee separately. But, their filling is kinda skimpy. We want to check out some of the other places here, we'll be back! If you've been an avid reader, you'll know I'm always on the lookout for new chocolates to try. Recently, these caught my eye. Wild Ophelia is actually a collection made by the creator of Vosges chocolates. 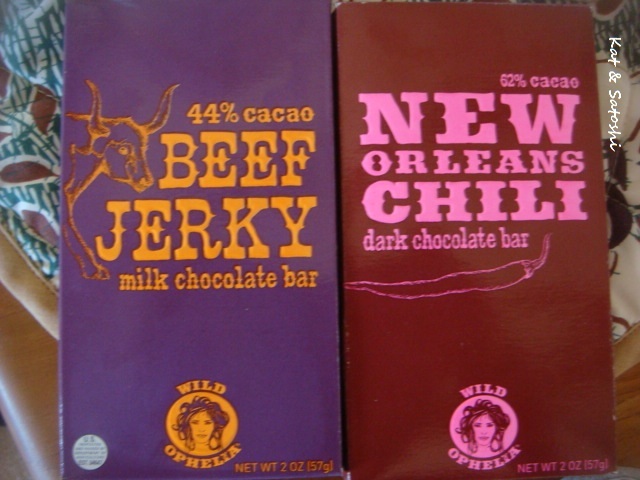 Their 44% milk chocolate with beef jerky actually reminded me of the Vosges' Mo's Bacon Bar, except with a more distinct beef jerky aroma. 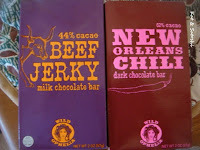 And the 62% dark chocolate with ancho, chipotle, cayenne & cinnamon in it reminded me of the Vosges' Red Fire Bar. Even though they don't seem as pricey as the Vosges bars, they are smaller in size. I found these at Price Busters and hope they bring more flavors in. 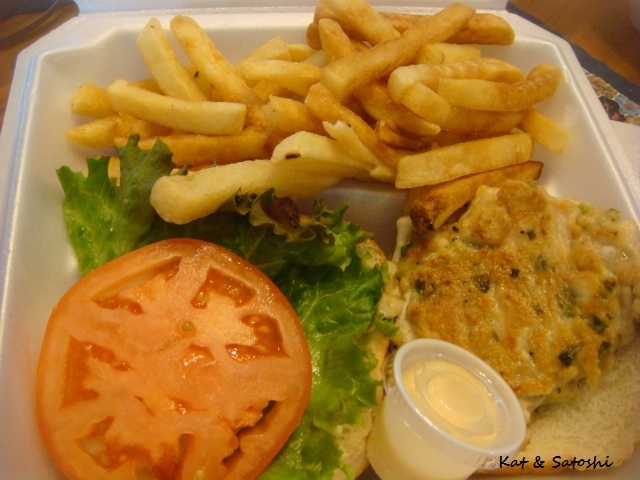 We went back to Queen Street Cafe & Grill the other night to pick up dinner. Wow! The price is just a little higher than the Zip Pac, but this combination beats out Zippy's Zip Pac for sure. 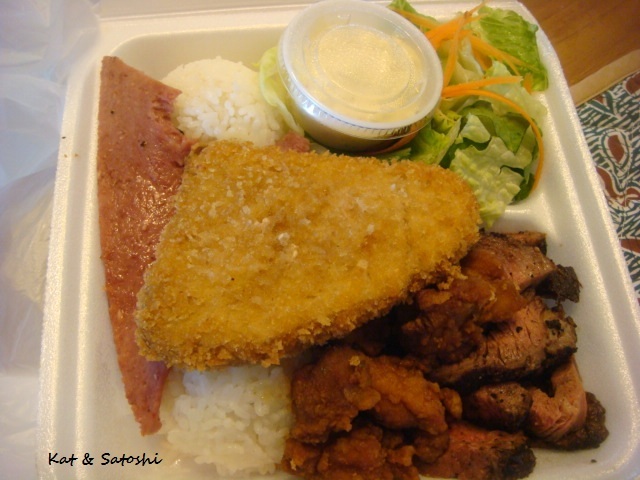 Look at that ahi katsu, the real deal! Their furikake garlic chicken seemed more like mochiko chicken, but it was still delicious. She couldn't finish this (and is gonna eat the leftovers another day) but she's was happy she tried this. I tried their Fried Pork Chop with Mushrooms and Onions...$7.50 + tax. I also tried their garlic mashed potatoes. The mashed potatoes were smooth, creamy with LOTS of minced garlic in it. 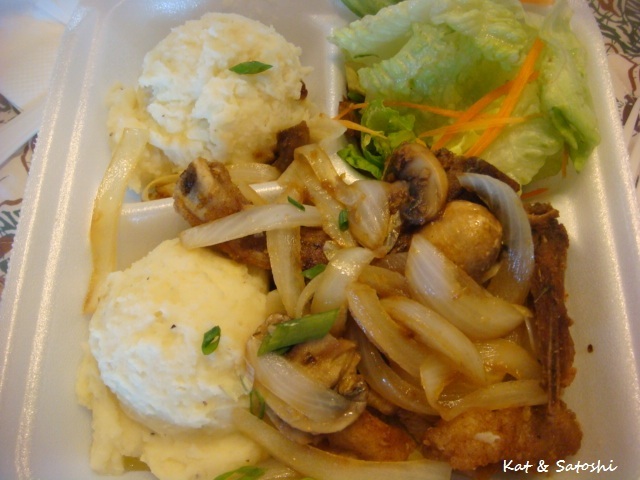 The fried pork chop was cut up into smaller pieces after it was fried and you even received the bone, but what you can't see is all that butter that the mushrooms, onions and maybe even the pork chop was fried in....mmm! I ate the whole thing...sigh! Definitely a great place and you get your money's worth. You know how fro-yo was trending? Well, now it seems to be cupcakes. I think it has to do with one of our local cupcake shops winning on the Food Networks' "Cupcake Wars". 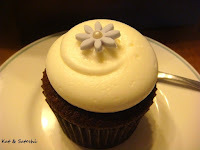 Anyway, I don't particularly like their cupcakes, though they do have their fans. I am always willing to try new places though, like Sugarlina Bakeshop. I actually found out about this place on one of my social media feeds. 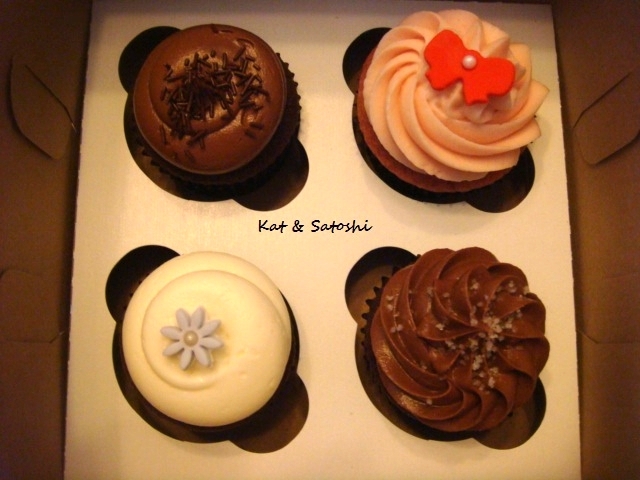 After dinner at Tadashi, we picked up some dessert...chocolate, strawberry (buttercream frosting), chocolate & vanilla (cheesecake frosting) and fleur de sel (caramel center). This place is pricey...$2.95 +tax for a cupcake. 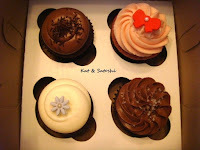 My mom (she had the strawberry one) said that their buttercream frosting was delicious. I thought their cakes were quite moist (even though they are kinda sitting out). 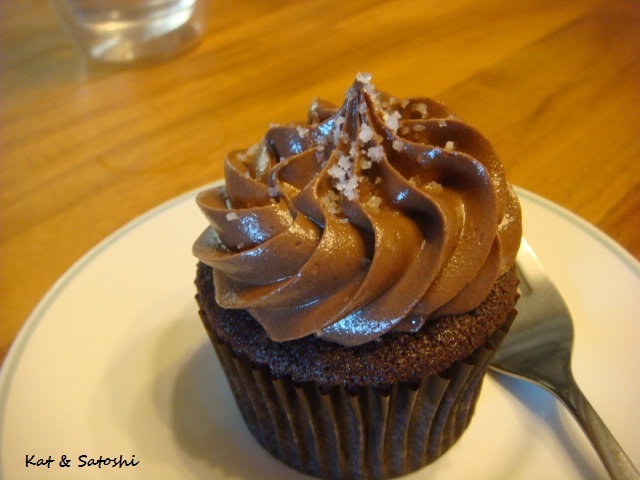 If you bake, you'd probably think that it was outrageous to pay so much for something so little. Would I go back? probably for a special occasion. On Satoshi's last night in Hawaii, Mom took Satoshi and me out to dinner at Tadashi in the Pearl Kai Shopping Center. 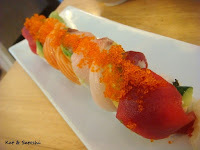 Since she doesn't eat raw fish, Satoshi and I shared this Dynamite Roll, topped with scallops. 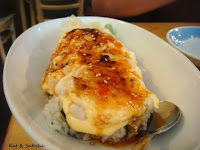 I'm not quite sure what was in the sushi, but it was topped with sweet chili sauce mixed with mayo then "blow torched". We agreed, it was good, but too much mayo on this one. We also shared this Rainbow Roll. Mom enjoyed her Tempura teishoku. 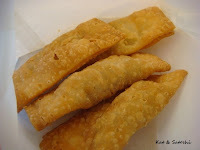 Everything was hot and the batter, light and crisp. With all the economic woes, places come and go, I'm glad that Tadashi is still around. I think Satoshi enjoyed his vacation here, "Thanks for dinner Mom!" Recently Dean's Drive-Inn was featured in the paper, and since Satoshi was here, Mom thought it was the perfect chance to check them out. 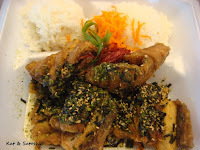 Satoshi ordered their Island Fresh Ahi (yellow fin tuna) Belly Plate $11.95, this came with choice of soup, tossed salad or mac salad, Satoshi chose their bacon potato chowder. You could also choose how you wanted your Ahi Belly prepared (furikake, butter & capers or shoyu ginger), he chose furikake. He said this was good! and ate everything not leaving any to share. Mom and I chose the ahi cake sandwich $9.95 each, this came with choice of fries, tossed salad or mac salad. I took fries while Mom chose mac salad. She wasn't too impressed with their mac salad, but feared that if she ordered fries they would be soggy. They were, but were delicious with that sweet chili aioli they serve with the sandwich. The ahi cake (patty) was a nice size too and filled with lots of the fish, delicious! 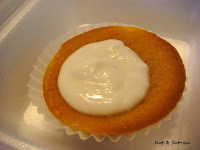 For dessert, the 3 of us shared this butter mochi with haupia (coconut pudding). Butter mochi is a local favorite, the mochi is buttery & coconutty and with the addition of haupia, it takes this over the top! $2. A bit pricey, but for fresh seafood, totally worth it! We'll be back! Satoshi was here for about 5 days and we got to play tourist a bit. 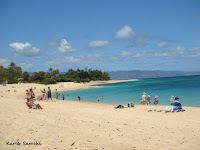 On Tuesday, we headed to Haleiwa, he really likes this area. 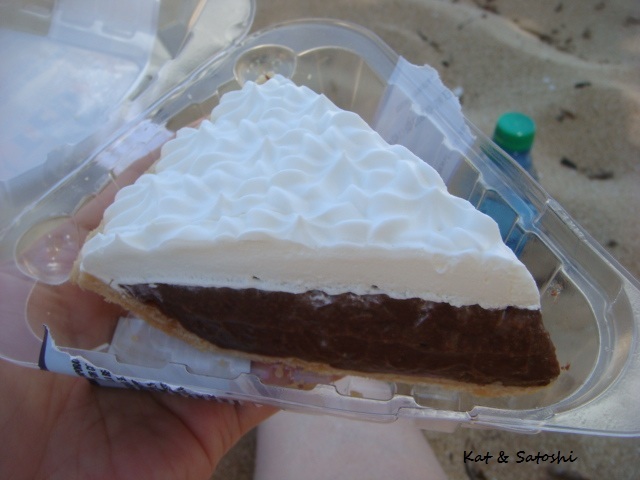 We checked out Ted's Bakery, which is known for their chocolate haupia pie. I had heard that they also served plate lunches, so I figured we could pick something up then eat it at the beach. So, we ordered a Loco Moco for Satoshi...$9-something. 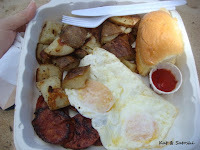 Portuguese Sausage & Eggs for me...$8-something. And their chocolate macadamia cream pie...$3-something. I didn't quite read the label when I took it from their refrigerator, so that is why we missed the one with haupia. Um, the food is decent here, BUT it took over 30 minutes for us to get our food! If anything, I would go back for the pie, but probably for nothing else. 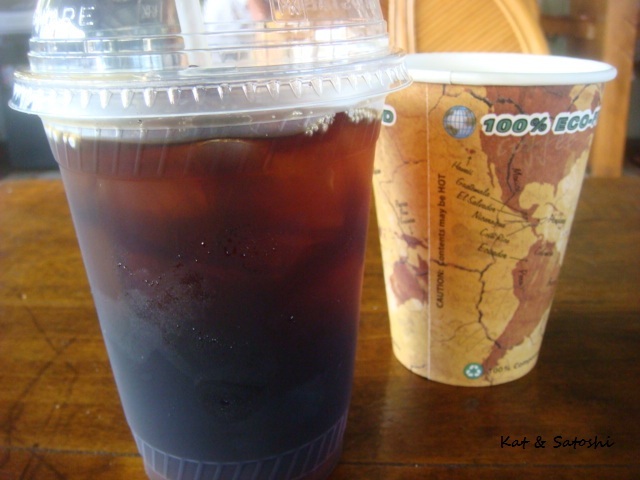 After brunch, we headed back to Haleiwa town and spent some time at Coffee Gallery. 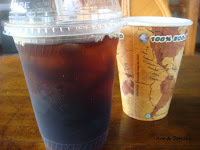 An iced French Roast (cold brewed) for me and a Haleiwa Blend for Satoshi...$3-something for both. 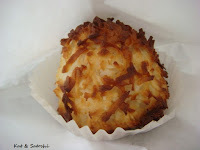 Free Wi-Fi was a plus...overcharging me for this coconut macaroon (which I didn't realize until afterwards...not cool!) was a double minus. Then as we drove through Waialua, a sign caught my eye... "coconut peanut butter". 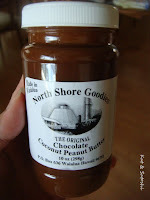 We checked it out and I found that North Shore Goodies also makes a chocolate coconut peanut butter. We got to sample both and they were delicious, can't wait to slather this on a bagel or melt some to drizzle on vanilla ice cream! 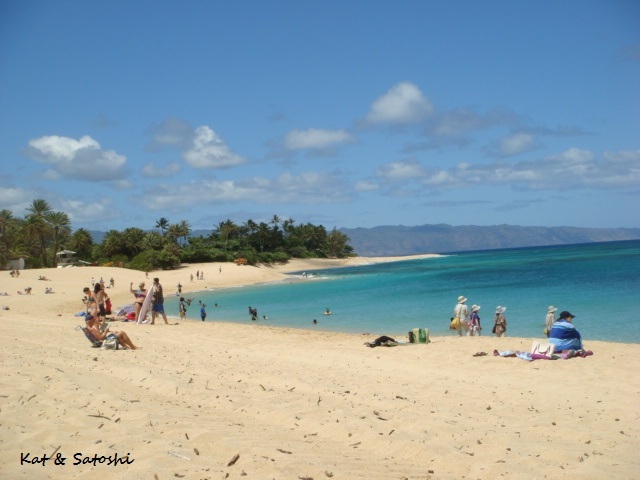 Despite the minuses, the weather was wonderful, we contributed a little to the economy and Satoshi got to see some of his favorites sights in Hawaii, in essence it was a good day. 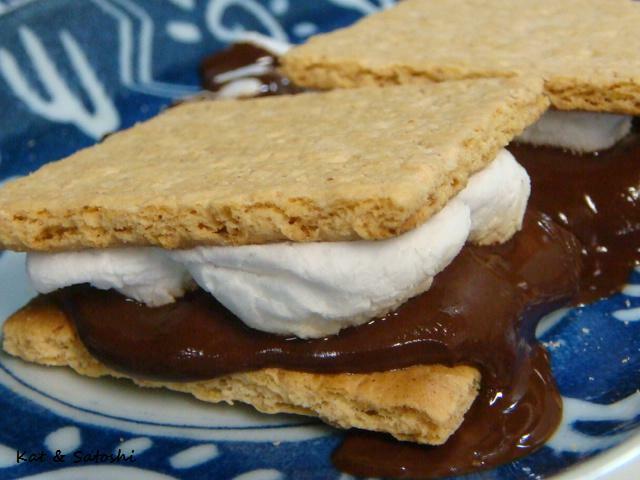 According to the latest issue of "Honolulu Magazine" the 10th of August is National S'mores Day. I didn't have a chance to make some, so I instead decided to drool over some photos of some I've made in the past. This one is "traditional" but using dark chocolate instead. 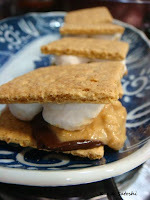 And this one is with the addition of peanut butter. Our food culture in Hawaii is "unusual" to many. We eat SPAM as well as other types of canned mystery meats. 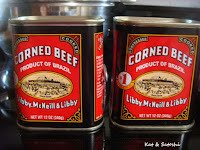 One mystery meat in particular is canned corned beef. Growing up we would mix a can with some onion, cooked potato and an egg. Spoon out a dollop into a heated pan with oil, cook on both sides and dinner is served. 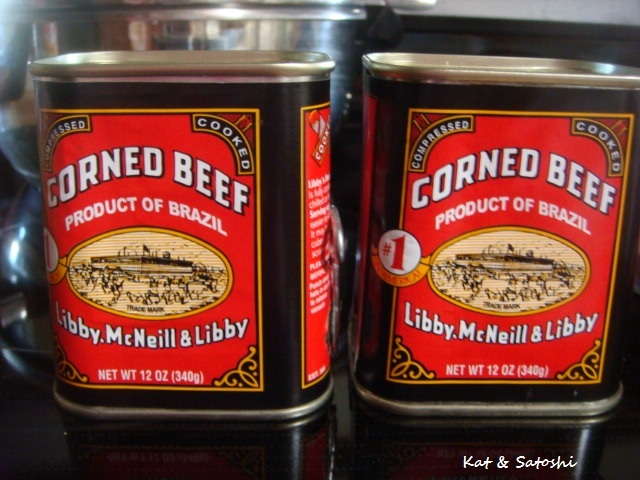 If your family was larger, more potato was added to "stretch" the can of corned beef. I recently learned that there is a shortage of corned beef. Apparently, anti-parasitic drugs in high levels were found which stopped the export of the canned goods from Brazil. This in turn, caused the price to sky rocket here. In fact, I've seen stores stock their corned beef behind the customer service counter, so no one "walks" off with them. A market recently had a sale on this and we picked up a couple cans. 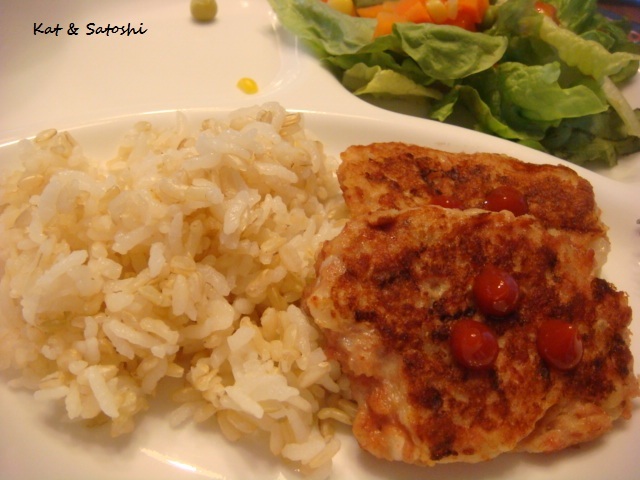 It made for a great comfort food dinner. What is a comfort food for you unique to where you live? I recently reconnected with this particular tsukemono. 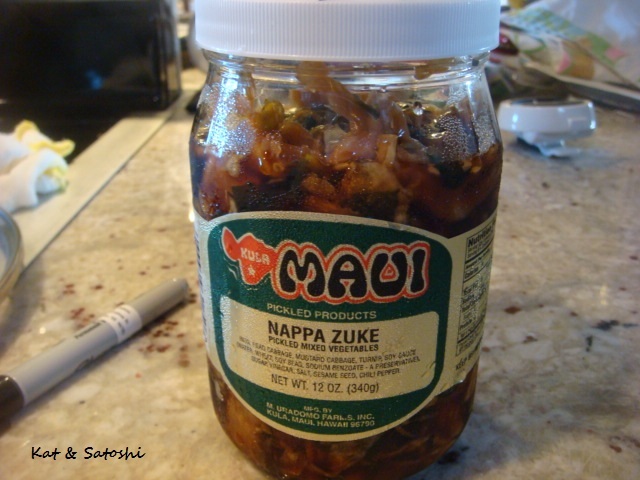 It tastes like the recipe I use for yatsumi-zuke. I'm gonna try using other veggies next time I make this. 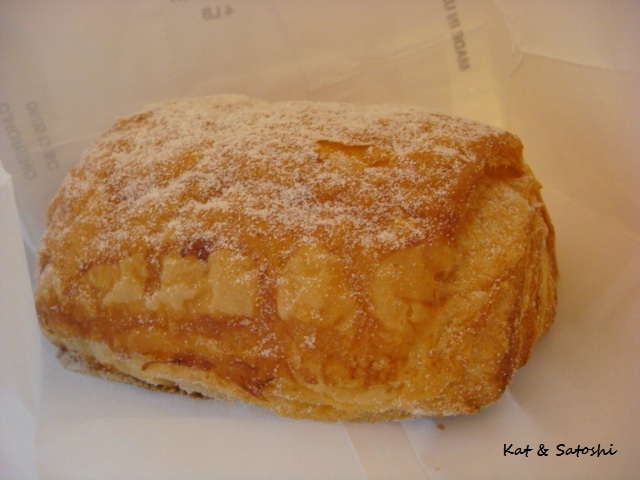 Mom and I have been wanting to check out Fendu Boulangerie for some time now, we just didn't have a reason to be in the area. Well, last Friday, we finally did. The bakery is very small, with just two glass cases. We were there at 10-ish and had intended to pick up something for lunch, but didn't know that they don't make sandwiches until 11:00 a.m....boo! So, we ordered their breakfast panini...$6 or $7-something. 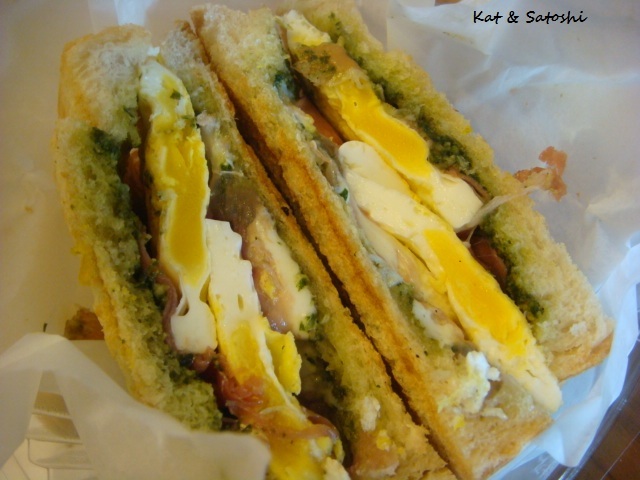 Mozzarella cheese, proscuitto, an egg and pesto. It was delicious and it also took 15 minutes to prepare. 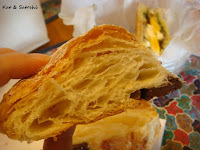 I also tried their pain au chocolat. At $2.25, it looked like a nice size. I'll give them props for making delicious croissant and using dark chocolate though. She was surprised at the price and the size of her slice because it was kinda teeny. 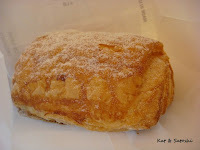 It was delicious though with a nice flaky crust. So, would we go back there again? meh, probably not.